What are we working on now, you ask? Airing on the porch, about 7′ tall and 30″ wide. I’ve been asked this a few times over the last several weeks. It appears as though we aren’t doing much when I don’t write it up here and post the photo journal alongside. However, we continue to plod along, on smaller projects as of late. Furniture. We’re doing furniture and gardening right now. 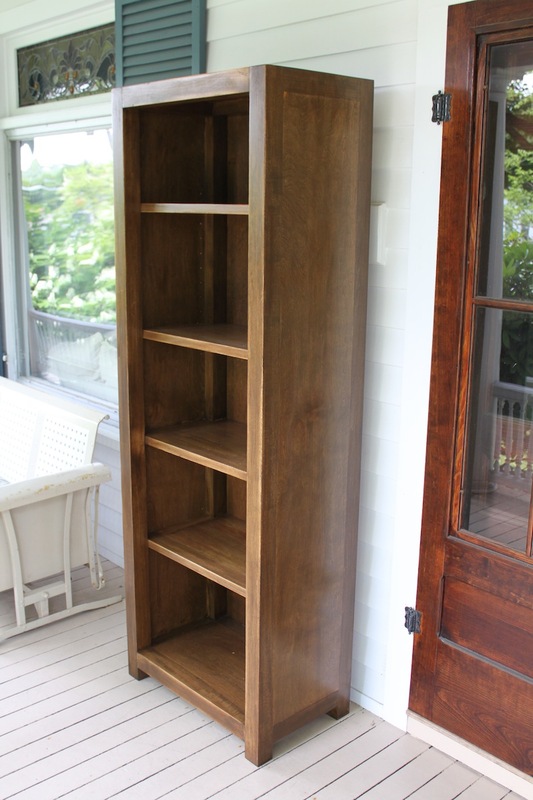 We’ve just finished a bookcase to match the other in our living room and its presence will allow me to finally unpack the final book boxes sitting in closets for the past 3 years. Right now, it is sitting on the front porch airing out, hopefully to lose the waxy smell so we can bring it in soon. It will live in our living room for the long haul. Even though we’re going to build a full floor to ceiling set of bookshelves in the library eventually, I will still need all the shelving I can get. I’m now housing toys and baby books and DVDs in the living room, too. So storage is of the utmost priority. 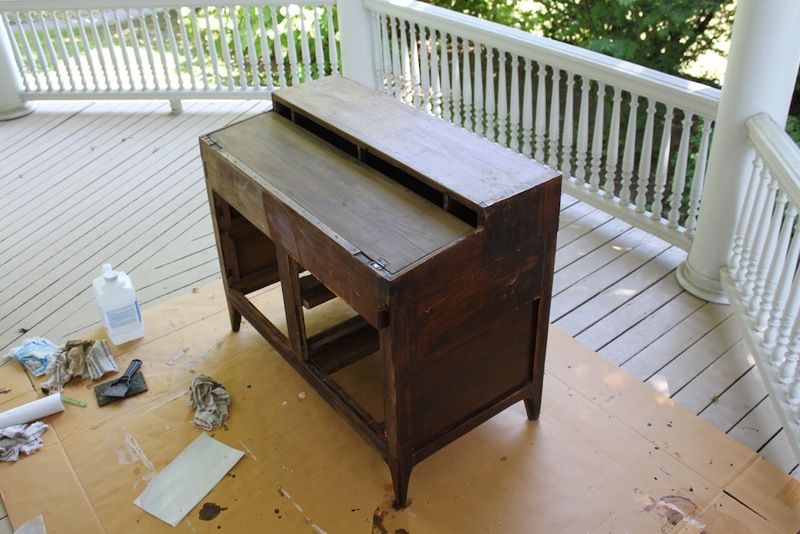 I have been refinishing a pine desk that we use to hold our TV and DVDs. It was a dark shellaced piece that we found at the Bouckville Antique Show. The front has four drawers and the top folds down to be a desk, but it can stay folded to resemble a small dresser. At first I waxed it, but this year, I wanted to repair all of the scratches. So, I’m stripping it down and lightly sanding. I can’t decide at this point whether to stain or just clear coat the wood. Aged pine is quite nice. Bill has been working on a table for Will’s room. Now that he is a toddler (and I never finished the nursery mural), we have changed some of his furnishings. We added a bookcase for more of his books and animals and we’ll put in this table for his trains. Will is so interested in trains and cars the past several weeks; I can’t imagine this changing anytime soon. We are collecting the Thomas wooden railway for him, so he could use a nice play table. Besides this furniture, there are several pieces in our basement that need refinishing and new upholstery which I’ll slowly tackle this summer. Bill will begin work on the hall closet, adding a floor and lighting. That will be a whole other post, though. We’re waiting for a while to work on plaster or scrape down the garage. Lead paint is an issue here, and we don’t want to work on areas in the house that could cause lead dust for Will’s sake. So far, the rooms we’ve completed with him around have been very light on lead. But we are eager to redo the garage and get it cleaned up, along with the floors, repaving the drive, building a wine cellar, adding bookshelves, finishing the guest room, redoing the downstairs bath, redesigning the laundry and kitchen and laying a stone wall out back. There will always be something we are doing; and there is plenty to do. So, please ask! It might prompt a blog post.